I've traveled the world in search of good burgers, but Prague is home for me. My hunger for burger knowledge here has never been satisfied. 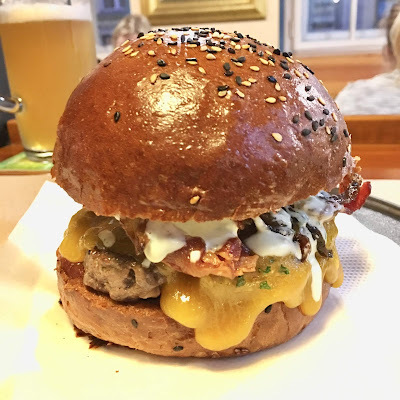 Over the last 11 years, I've ranked 202 burgers in and around the Czech capital. In this 12th year, I'm adding another 27 to that total. That said, I need to scale back in the year ahead for my own health and for that of the planet. I'm not saying I'm going cold turkey... burgers. Not yet. But change has gotta come. As always, this is not a "best" burger list. What's best for me can never tick all boxes for everyone. And remember, restaurants don't cook the same way every night over the course of a year. This is a list of my personal favorites, based on what I consider important. So what's on my checklist? I prefer fresh, high-quality beef, coarsely ground, cooked medium, with a fat content around 20 percent. I prefer a patty that is flame-grilled or griddled with a seared crust and liberally salted on the exterior. I want lightly crisp (but not brittle or dry), smoked bacon. Well-balanced construction is important. I'm not interested in how much can be shoveled onto a bun. Balance helps contribute to good taste and makes it easier to pick up and bite a burger. Lettuce sticking out all over the place is particularly annoying. A bun that is light, not dense, and holds it all together, start to finish, can make or break a burger. Brioche-style is a favorite. They should be toasted or grilled. An oven-warmed bun is going to get all flaky on you. The burgers were rated as I experienced them. If they got better or worse the week after I visited, and you have a different opinion, that’s great. I'd love to hear it. But remember, you didn’t eat the burger I ate on the day I was there. Ten burgers on this list were new to me. There are some good ones I've heard about but didn't have time for this year. I also crossed off previous losers. I'd have the top 20 or so again, and forget about the rest. If there's one word I'd use to describe the flavor of this bacon cheeseburger, I'd say "gray." This was the loser of the year, which surprised me because it was quite popular with others. I did an Instagram poll before announcing my own verdict. Thumbs up won 102-42. I was firmly in the thumbs down camp It looked good from the outside. My main problem was the patty. I cut it in half, which illustrated the issues: The grind was too fine, it was too tightly packed, too dense, cooked all the way through, the ground beef was over-salted throughout, and it was dry. I could not finish it. After I posted about it, they sent me a message saying they had had a bad day, and I should give them another chance. I'm going to be very selective about what I eat in the next years. We'll see. 170 CZK, fries not included. The burger here was deliciously smoky thanks to their Big Green Egg grills. I wouldn't fault them so much on flavor. But the incredibly rubbery texture of the patty ruined it for me. I haven’t had such an oddly squeaky patty since I tried Peter’s Burger Pub several years ago. It can be red in the middle and yet cooked all the way through. One explanation I was given is that this happens when salt is mixed directly into the raw ground beef, which "cooks" it while it waits for actual grilling. I'd never eat this again without a radical change to the patty texture. It was also too tall and messy. The barbecue sauce was odd, with a sweet cherry flavor. The over-abundance of dark, curly lettuce on the bottom detracted from the visual appeal and eatability. The smoked bacon was very good. 215 CZK, fries not included. 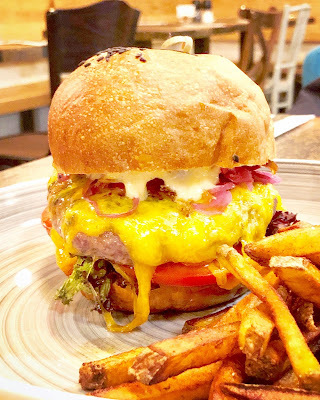 Jacob’s Restaurant specializes in burgers but a classic bacon-cheeseburger was not an option. I thought the Grand Burger needed improvement. The ground beef was dry and cooked through. Fat content needed to be higher. There was way too much lettuce. That’s not a side salad in the photo. The guacamole seemed to be mixed with a ton of mayo, but I wasn't quite sure how it got that way. The bacon was soft and ham-like. The bun was fairly stale. The young servers at this new spot were friendly, and it was quite busy. But I had no interest in going back. 190 CZK fries not included. The bacon cheeseburger at Beef Bar near Národní nothing special. I got the 100g patty, which was like a tall slider. The problem, again, was that the meat was salted all the way through, so it had that rubbery texture. It’s a shame because they have quality beef and a smoky flame grill. They used excellent cheddar, and I liked the caramelized onions. The bun was scorched on the bottom and stiff, so it was hard to bite. It fell apart and made a mess. The bacon had good flavor, but it was hammy. The homemade fries were OK. It came with ketchup and spicy mayo. 175 CZK including fries. 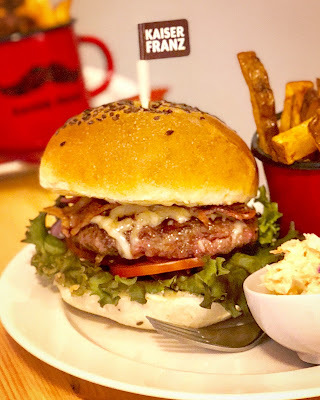 The large 200g burger was 295 CZK. On past lists, I used to include Burger King as the "control" in the rankings. However, as I mentioned last year, I've come to loathe BK. So for the first time in the history of Brewsta's Burgers, I switched to McDonald's. There's a method in this madness: Fast food burgers are a universally known quality (or lack thereof). 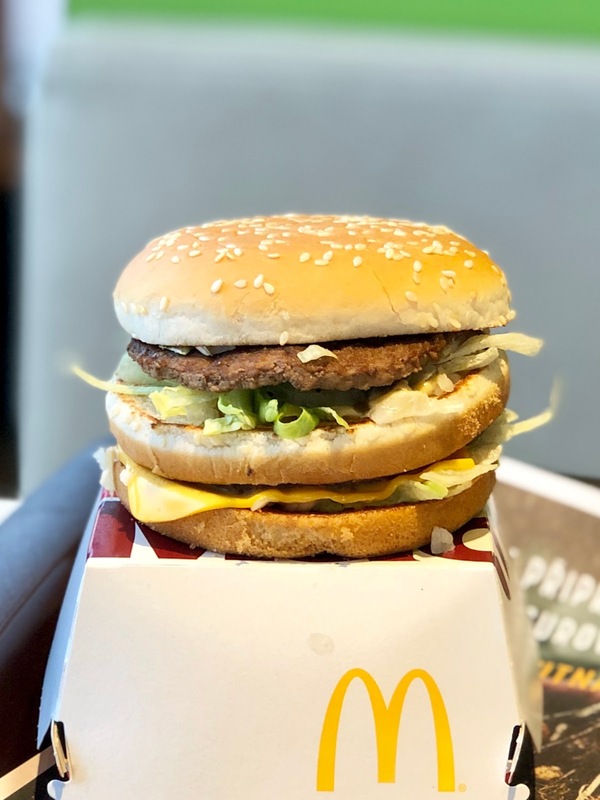 If I like a Big Mac more than the offering at a real, full-service restaurant, the owners and cooks should rethink what they are doing. It's my new version of the Big Mac Index. It is also on the list to troll the witless people who only look at the pictures and don't get the point. So, how was the Big Mac? Sweet. I mean that literally. The patties were the usual dry disks. There's a ton of sugar in the bun. If there's one thing I kind of like about these things, it's the sweet and tangy special sauce and the contrast of the sour pickles. The sodium content makes my heart flutter and not in a good way. 85 CZK without fries. 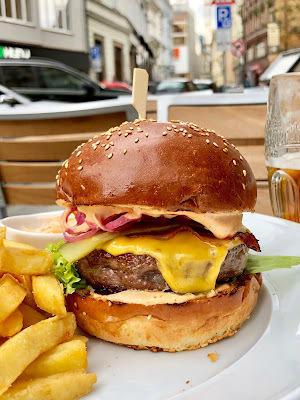 I tried the original Domyno Burger Bar out in Prague 4 a few years ago and didn't like it much. I felt the same about the new #2 outlet on Vodičkova. Their burger had soft, hammy, smoky bacon. The lettuce sticking out from the sides really hurt the looks. There was lots of mayo, tasty cheddar, sautéed onion, and sour pickles. The chewy ground beef was too dense – a real flaw. I also had an issue with the bun, which was too bready and too big for the patty. It was better than fast food, but not by much. 199 CZK, no fries. Extra ketchup was free, but it was not Heinz. I’m downgrading the Bacon Cheese Burger at George Prime Burger. The beef may be good-quality, but the grind was just too fine for me, and the patty had a dense, slightly rubbery texture. I'm not sure if they put salt in it prior to cooking. Although I mentioned this issue in my 2017 review, it bothered me more this year. It was cooked to medium. The saving grace was the amazing maple-glazed, smoked bacon that boosted each bite. Construction was balanced except for too much lettuce. I had to remove some. The bland, chewy bun was not really toasted. Thankfully, they have Heinz ketchup. It normally comes with a lemon-Dijon aioli that I found overpowering. There were also tomatoes and pickles. 240 CZK, fries not included. The Slider Taster Set at Café Sladkovsky in Vršovice came with three variations: bacon, barbecue, and chipotle. The meat quality was good, cooked medium, but the patties were bland and needed salt. The bun tops were stale and hard. The bacon burger was good and smoky, the barbecue burger was dull, and the chipotle salsa had a hint of heat. On two of the three, the flavor of the thick tomato slice dominated. 210 CZK, fries not included. Next time, I’d get the regular burger, which I've enjoyed in the past. The Black Angus Burger was good, but I didn't like it as much as previous years. The ground beef was excellent, picking up smoke from their Josper grill. It came with sweet, caramelized onions, smoky cheddar, lots of mayonnaise with chopped pickle, tomato, and mixed leaf. It had fruity, sweet homemade ketchup. It was tall and hard to bite, even after compressing with my palm. Juices dripped all over the place. I added salt, which really elevated the flavor. It was cooked perfectly medium. The toasted bun was too chewy. Loved the homemade fries with skin. 258 CZK plus I had to pay 35 CZK for extra ketchup. The Royal Bacon Cheeseburger dropped in my esteem this year. The quality ground beef and light brioche bun were still top notch. But cold, dry, hard-to-chew bacon brought it down. Dull, processed cheese wasn’t fully melted. I really liked the caramelized onions. The long pickle slices could be more sour. Worcestershire-influenced ketchup always struck me as odd and not a classic flavor. It was still a burger that keeps the restaurant packed, but it was not the best it could be. 189 CZK without fries. The Bacon Cheeseburger had excellent ground beef that was cooked medium, I hit it with some salt, which got the flavor just right. It had smoky but soft bacon, lettuce, tomato, and raw red onion. Overall, I liked it a lot. I'd only take away some points for the bun, which was way too big and bready, and there was too much mayo. 180 CZK with fries and slaw, but the fries were on the soft side. Very good sliders. They were fairly large, and made with excellent ground beef, quality buns, real cheddar, crisp salty bacon, and red onion. I thought they could be even better with pickles or more ketchup to give them balancing tartness. The only problem here was too much shredded lettuce mixed with bland mayo. It made for a dull slaw. 109 CZK for one, 199 CZK for two, fries not included. OK, the bun was awkwardly large on the bottom. And maybe there was a benefit from low expectations. But I enjoyed every bite of this burger. The thick patty had a nice crumbly texture and rich, beefy flavor. Good meat. However, it was cooked all the way through (they didn't ask how I wanted it). I’d prefer medium. 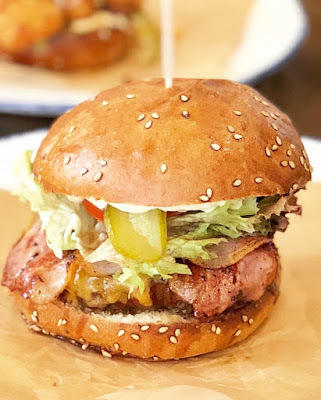 The burger had crispy bacon, caramelized onions, thick-sliced sour pickles, lettuce, tomato, and mayo. 179 CZK without fries. And of course, lots of great beers there that you don’t see in too many other places. The ground beef at this tiny, eat-in butcher shop had fantastic flavor and a top-quality crumble. It always bugged me that they served it on a lame, little Czech roll. It was prepared with mustard, pickles, and red onions. It's better when you ask them to add their homemade ketchup, which was a little sweet and not sour enough. The burger came out five minutes after ordering and was rare. I'd prefer a little more time on the grill, but the place was so damn busy (and uncomfortable), perhaps they want things to move along as fast as possible. I can only go there at odd times when the crowds are smaller. This burger would have ranked much higher, but it had a flaw that I've found here often in the past: gristle! Unchewable pieces of meat greatly detract from what would otherwise be an excellent eating experience. 205 CZK, no fries available. The Crispy Burger was very good overall. It had crunchy, smoky bacon, and crispy onions mixed with tangy, distinctive barbecue sauce. The quality ground beef was cooked perfectly medium, with a good grind and fat content. There was too much salt. The toasted bun was quite small, stale, and chewy on top. Chili cheddar and jalapeño-coriander gave it a unique and spicy flavor. There were also diced tomatoes and shredded lettuce. 205 CZK, fries not included. Very good burger, though I didn’t love it as much as last year, when it ranked #2. The peppery ground beef was a pleasure, and the crisp bacon was tasty, but it was not easy to bite this tall beast. There was an over-abundance of sweet, Hillbilly dressing, like Thousand Island, mixed with chopped pickles. It dripped out all over the plate. The big, fluffy bun was nicely toasted but couldn’t stand up to the strain and fell apart at the end. There was also red onion, tomato, pickles, and rucola, which I don't love on burgers. Overall, quite a mess to eat but fine flavors. 189 CZK without fries. The Salt 'n' Pepa Burger was made with aged beef and included cheddar, tomatoes, pickles, lettuce, tartar sauce, and barbecue sauce. There was smoky, soft bacon. The ground beef, cooked medium, had just the right texture and fat content. It needed a bit more salt. The sour pickles balanced the flavors, and it all sat on a quality, toasted bun. The barbecue sauce was not distinctive but, overall, this was a delicious and very respectable burger from a well-run kitchen. 185 CZK plus 20 CZK to add bacon. I had the Smoky Dish. It featured well-constructed, good ground beef done medium, well-cooked, salty bacon, sweet BBQ sauce, sour pickles, crispy onions, spicy red pepper mayo, and sturdy but bready bun. I enjoyed it much more this year after it dropped on last year’s ranking. There was one big flaw: pink juice covered the plate and soaked the bottom of the bun before I even picked it up. You can see it in the photo. 225 CZK without fries. The bacon cheeseburger had a lot of good going on. The high-quality, peppery beef, ground in-house and cooked medium, was the star. Presentation was excellent: I loved the separate lettuce, tomatoes, red onions, and pickles. Hot side hot, cool side cool. It was a balanced beauty. Bacon was crisp and smoky, but dried out. One big flaw held this burger back from pure greatness. The bun was too soft and Wonderbread-like for me and pink patty juice seeped into the bottom (see photo, bottom right). That turned part of the bread into an unholy mush. The burger comes with mustard and mayo, but I deleted the mustard. They’ll give you a bottle of Heinz, no extra charge, and I added some. Flaws aside, it was a classic burger that tasted great. And I love eating at the bar: super friendly, cool folks there. 289 CZK including good curly fries. This was the least conventional but one of the most delicious burgers I had this year. It's hard to categorize, and it's not on the menu all year. They do different variations, but this particular version at this Asian fusion restaurant came with bone marrow on top, and the bun was completely covered in decadent, pan-dripping mushroom gravy. This bugged me on the first visit, because it couldn’t be picked up. I had to knife and fork it, which felt very wrong. But that sauce was incredible – sticky, savory, fatty love – one of the best I’ve tasted in a long time. I wised up on later visits and ordered the gravy on the side. It was made with excellent beef, ground just right, cooked medium. There was an assertive, melted Emmental and a ravishing red onion chutney, bursting with the flavor of red wine. I jokingly called it a French onion soup burger. So damn delicious, I had it four times before they took it off the menu. And it was so unusual, it may not be to everyone's taste. I wanted to hate it, but I loved it. 225 CZK, no fries. The USDA beef burger was excellent and expensive. There was a big buttery flavor in that toasted brioche bun. The smokiness of the crisp bacon influenced the flavor of the cheddar. The mayo, also smoked, had a spicy bite. 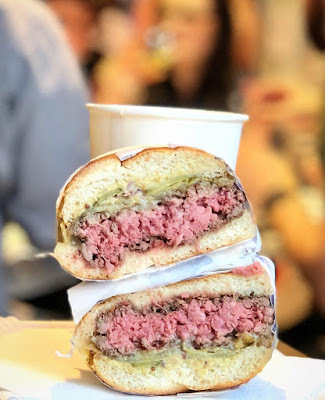 The patty, cooked medium, was topped with sour pickles, pickled onions, and lettuce. The only thing holding it back from the top-tier was the too-fine grind. The imported American beef wasn’t packed too tightly, the fat content was good, but the texture was off. 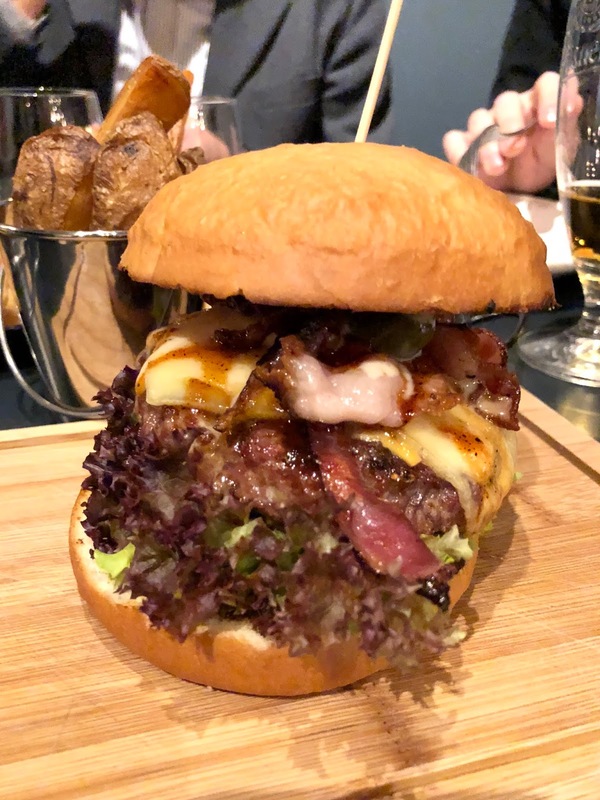 This burger was the priciest on this year's list at 395 CZK. That's close to the price of a burger at Union Square Cafe in NYC. 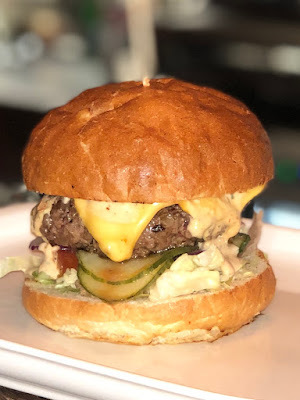 I liked the Monarch burger a lot, and it’s a great-looking restaurant with top steakhouse aspirations. But 45 CZK for a small dish of extra ketchup? That’s insane. It was only 4 CZK less than what they charged for a half-liter of Pilsner. I'll end on a more positive note: The included fries were terrific. This place opened in the summer of 2018 and wasn't on my radar until recently. But their burger vaulted quickly toward the top of the list. The gorgeous ground beef, cooked medium, picked up big smokiness from their Big Green Egg grill. The grind was a little fine for me, but the patty was so tender. It had great fat content. Sticking a fork into the medium-cooked patty sent up a geyser of juice. I was warned by a friend that their dry-aged burger special was drier. The crisp bacon had that super smoke. The basic yellow cheese got a flavor boost from the grill. Mayo was also smoked. I love smoky burgers so this was exponentially excellent for me. On the light but sturdy bun, there was ketchup, pickled onion, and wilted dark leaf lettuce. The tomatoes were cut too thick, so I pulled them off. I shouldn’t have been too surprised at the burger quality in this steak restaurant. One chef, Jirka Hrachový, worked at Kampa Park, Grand Cru, Zátiší Group and helped open Nejen Bistro. I discovered Meat Beer because I liked its sister restaurant in the Kolektiv group, Vyčep. 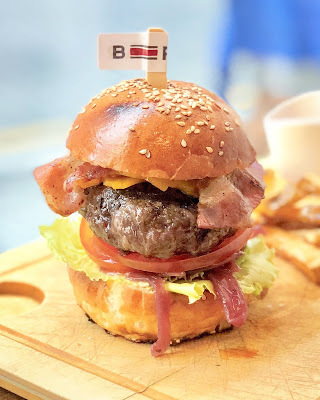 I’d compare the Meat Beer burger to one I had at Gordon Ramsay Burger in Las Vegas. It came with fries for 248 CZK. They have a top-notch burger at this little butcher shop at Jiřího z Poděbrad. Tender, peppery ground beef, smoky bacon, thinly sliced tomato, onion, and mayo were on the soft, good quality, toasted bun. The thick patty had the right fat content, a good rough texture, and was cooked medium. It was drippy, messy, and delicious. Rucola is not my favorite addition, with its own peppery flavor. But this is a straightforward, unpretentious, delicous burger. It's proof that sometimes simple quality can be the best quality. 168 CZK, no fries. The American Dream Burger was a beauty with fantastic looks. Some say the sister restaurant in Beroun does it better, but this burger was terrific. The great ground beef, cooked medium-rare, was close to perfect. It had a seductively smoky flavor picked up from the grill and the soft bacon. The cheese captured some of that, too. I loved the light heat from the Sriracha mayo. It had thin but assertive sour pickle slices. The tomatoes were too thick, and the shredded lettuce and red onions were awkwardly placed. The burger was a sloppy to eat, with onion slipping out. Overall, it had balanced construction on a sturdy but easily bite-able bun. The taste was American classic. The small 140g patty I got was 215 CZK without fries. The 200g patty cost 255 CZK. It ain't just all about the bacon here, but damn, there was a lot of smoky, porky greatness on top of that beautiful ground beef. 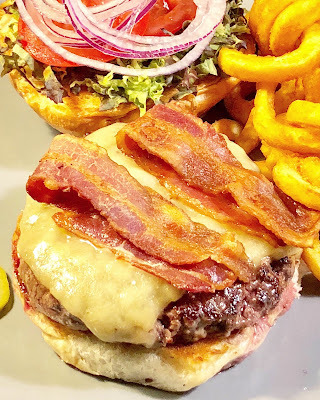 The Tavern Classic Bacon Cheddar Burger at U Kurelů was a glorious mess. It wasn't easy to eat, and construction and balance could be better. I had to break up and reposition the very generous portion of long bacon strips on top. Otherwise, they could pork your eye out. There was too much mayo and shredded lettuce for me. But it was so damn tasty! The combination of their savory meats with their sour pickles and pillowy soft bun inspired love. The burgers come with mustard, ketchup, and mayo, but I always tell them to leave off the mustard. When it comes to condiments on a burger, three's a crowd. The burgers here and at The Tavern (same American owners) remind me a little of Shake Shack, but better. And that's no small thing. 229 CZK without fries. The last two years, these sliders here were my number one favorite. And they were still totally great. They were also magnificent bacon bombs, with an abundance of crisp, crunchy, smoky goodness. Their pickles and sweet, tart slider sauce evened out the saltiness. Shredded lettuce and chopped onions stayed firmly in place under their perfect and pliant buns. I wouldn't rate their ground beef as the best, but it's very good. There was just something about the quality construction, the proportion of each ingredient placed in just the right balance that made each bite a pleasure, start to finish. You feel the love and thought that went into designing and building this burger. Mr. HotDog has been a home away from home, and one of the burger places I visited most last year. 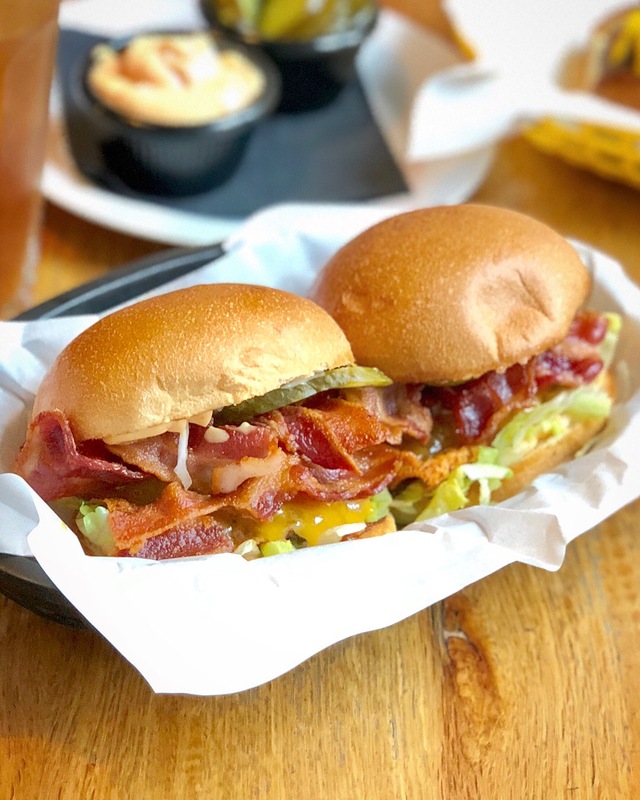 Their bacon cheese sliders, which were not small, could qualify as a small burger. 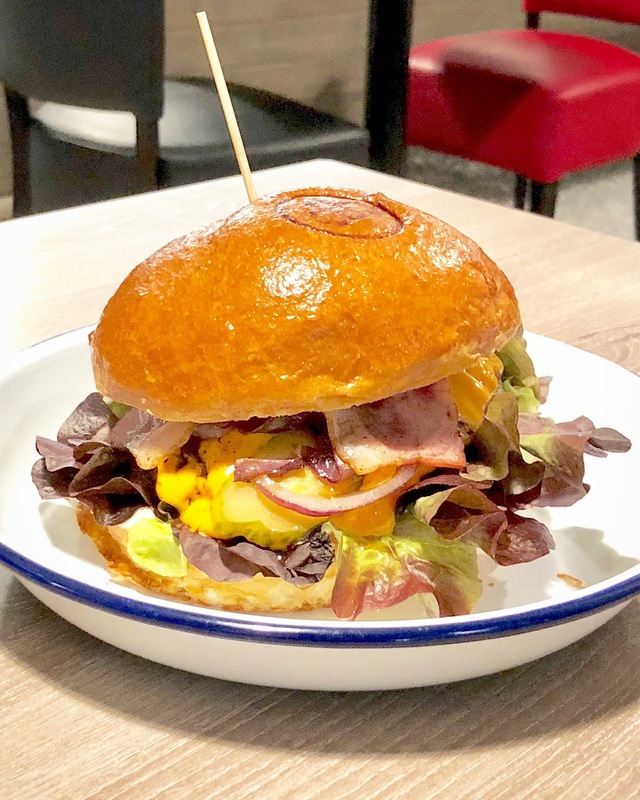 99 CZK, great McD-like fries not included. If the number of visits per year helps determines the winner, Kantýna and Mr. HotDog were close to a tie. But the fact is, the quality of the burgers here was almost off the charts. Their grilled ground beef is world class. Last year, I spent close to $40 for a Black Label Burger at Minetta Tavern, one of the best in New York City. 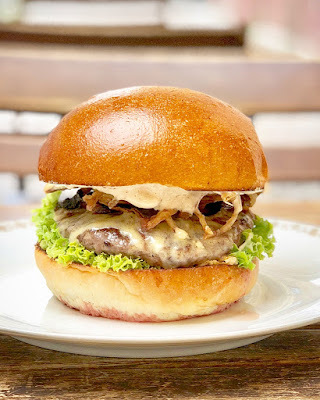 Kantýna's burgers compare very well for a third of the price and with far less pretentiousness. Many a time, I braved the meat-mauling crowds at this butcher shop restaurant to sample every burger variation from their kitchen. Some versions were only offered on random occasions, so you had to be lucky. Every single one was a winner that could and does top this list. Their buns were nothing special, the toppings were varied and not always classic, the foil wrapping was annoying, but the ground beef was the absolute prize-winning star. The burgers had the most marvelous seared crust and char, with smoky flavor from their grill. The patties had a redolent richness inside, always cooked to medium. They had fabulous fat content to give them the right amount of moisture, with a coarse grind, but still held together perfectly. I usually asked them to add ketchup to my burgers, though theirs is homemade and tomato sauce-like. And now I'll rank the best of the best of their burger variations: 1. 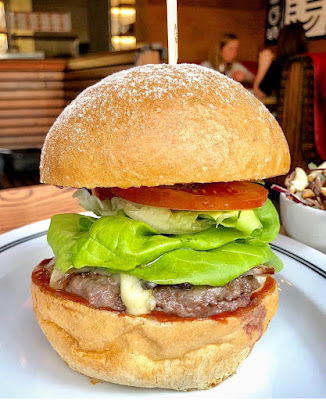 Wagyu Burger 2. Veal Burger 3. Dry-Aged Beef 4. Regular Beef. I always had to go at off-peak times or I'd get too frustrated with the hectic nature of the restaurant. But after every burger, I've left feeling very lucky, indeed. We are very fortunate to have such a burger in our city. That’s my list for 2018. Feel free to agree, disagree, and/or share your own rankings in the comments or on Facebook. I'll be lurking around to answer questions, defend decisions, or just enjoy the debate.